JIP LN NVSE Plugin Also requires NVSE, for the same reason. This is for the various vision modes. As this is not my own work, but rather just a further improvement on an already large collaboration, I'd want to make sure that anything you want to do with the mod goes along with the wishes of VT08 who I initially contacted for permission. Hence I ask that you contact me first if you wish to modify any of the files. VT08 - Organization, hosting, model & texture work on the original mod. EmeraldReign - Model & texture work, and the original plugins. Weijiesen - Original model & texture work. 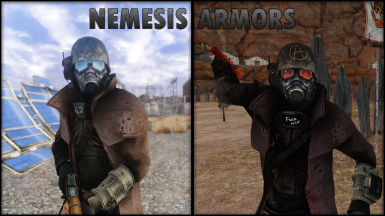 Exeter - Improved armor meshes for the original mod. 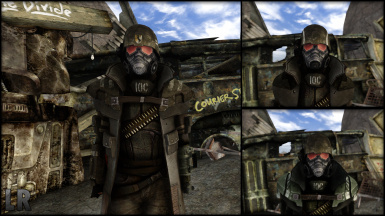 Gopher - Neck covers for the original mod. AI99 - Initial PN patches and some previous updates. 13xforever - Fixing the initial installer used in the F&L guide. EssArrBee - Making the installer compatible with FOMM/NMM. MonoAccipiter - Hosting the updated version, fixing the original patches, model & texture work, level editing, writing, balancing, bug fixing, and making the latest installer. darthbdaman - Writing the modular patch scripts for the latest version, and making the change to a master structure. 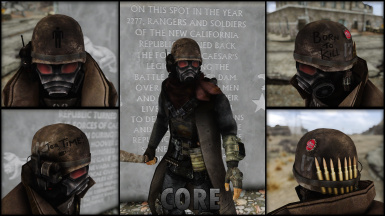 Renamed "Desert Ranger Custom Helmet" to "Custom Desert Ranger Helmet"
Renamed "Desert Ranger Clean Helmet" to "Clean Desert Ranger Helmet"
Renamed "Defaced Ranger Helmet" to "Defaced Ranger Combat Helmet"
Renamed "Prototype Riot Helmet" to "Prototype Riot Gear Helmet"
ADAM Reborn is the continuation of the original ADAM mod, which is the most feature-filled Ranger Armor overhaul ever made, covering all Ranger-related armors in both the vanilla game and the DLCs. 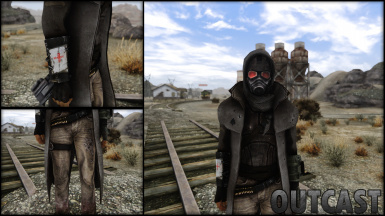 The original added better meshes, new textures, compatibility with popular mods like Project Nevada and many more features. It also had a lot of bugs. This mod initially began as a bug-squashing adventure, but grew to such an extent that it was only fitting to give it a name of its own. 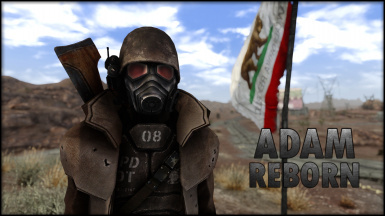 And what better name for a mod that redid the way ADAM worked from the ground up than ADAM Reborn? 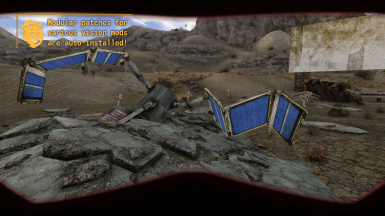 Added to the vast array of features in the original is a new installer, simplifying a far-too-complicated installation process; a complete rebalance of all added armors; new female meshes for the armors that did not have them initially; redesigned quest assets for the mini-quests that let you acquire some of the new equipment; a smarter vision mode and general patching system that detects whether you have Project Nevada, Advanced Recon, or Faction Armor Usage Enhancement; an extension of those features to all gear; new world meshes that make sure the helmet you drop is the helmet you wear; and a completely new Rangers on Patrol module, better aligned with the events in the game. All-in-one download with an installer, choose between individual modules or a complete plugin. 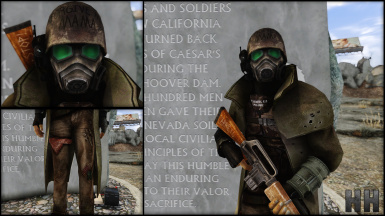 Modular patches for Project Nevada, Project Nevada Extra Options, Advanced Recon and Faction Armor Usage Enhancement. Adding visions modes and other properties to all relevant equipment, including those overlooked by the original authors. Rebalanced versions of all additional equipment included in the original. Refurbished assets for the various mini-quests included in the original. ﻿﻿!NB! that the patches are modular means they only activate when you have those mods installed !NB! Install with your favorite mod manager (MO is recommended) and follow the instructions in the installer. Make sure to load the plugins after FAUE, if you use that. Check the ReadMe if you have any additional questions. 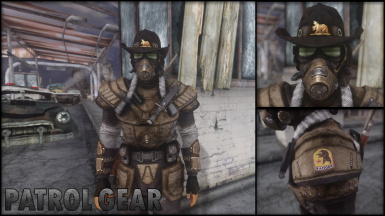 The Custom Ranger Armor currently has no female mesh. I am unlikely to ever find the time needed to fix this. Helmets sometimes turn black in certain positions when indoors. I have no idea what causes this. MonoAccipiter - Fixing the original patches, model & texture work, cell editing, writing, balancing, bug fixing, and making the latest installer. 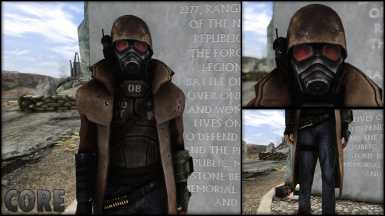 Sistro - Fixing an issue with the Prototype Riot Gear changing textures. mod goes along with the wishes of VT08 who I initially contacted for permission. Hence I ask that you contact me first if you wish to modify any of the files.